Six Brahmas win cash prizes in Diamond Bar's annual "Through My Lens" photo contest. Six Diamond Bar High School photography students won titles for their captivating photo submissions in Diamond Bar’s annual “Through My Lens” Photo Contest last month. Every year, the city of Diamond Bar hosts a photo contest, which is open to residents of all ages. The entrants submitted their city photo in one of five categories: nature, digitally altered, people, pets and places. Within each division, honorable mention recipients were awarded a $50 cash prize, first place winners were given $100 and the overall best photograph winner won $150. In addition to a cash prize, the winners also received certificates and an opportunity to have their photo showcased on the city’s calendar, service guides, monthly newsletter and website to promote the contest. In the nature category, senior Kelly Yap won first place with her close-up photo of a dragonfly hovering in a garden. In the same category, junior Ankush Sahgal won honorable mention with a picture depicting a bee resting on a golden yellow flower. Junior Jimmy Wong also won honorable mention in the pets category. His high-quality photo captured the innocence of a dog playing at Pantera Dog Park. His father is also a photographer and had entered in the contest before. He convinced his son to enter in this year since Wong is currently taking the photography class at DBHS and enjoys taking pictures during his free time. In the places category, senior Eric Quach won first place with his submission that portrayed the calming essence of an early morning sunrise in Diamond Bar. 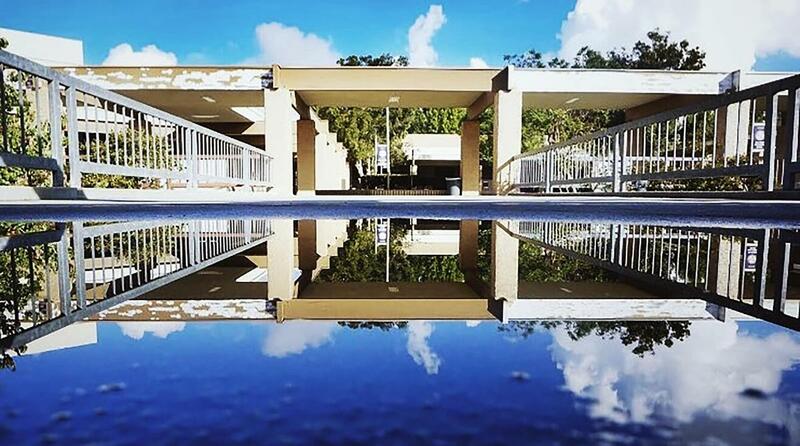 Also in this category, senior Tiffany Wang received honorable mention for her photo illustrating the reflection of the DBHS bridge leading to the upper quad in a small pool of water after a rainy day. Senior Melody Lee’s entry won honorable mention in the digitally altered division. Her edited photograph was a perfectly symmetrical water droplet combined with the reflection of America’s bright red and white stripes.